Little did I know then, what I know absolutely, for sure, now…that the Lord was orchestrating this week, starting many many years ago, in order to create a life changing, life altering week/experience for each and every person, who was hand picked by Him to be there. I was just one of over 40 people who were there, and when you hear my story, mixed in with some of the lives of others there, you are going to be absolutely astounded. I actually wish that I could see your faces and hear your reactions as you read about my story on this ranch, and I wish that every person who was there could share their individual stories of how their lives were impacted…from the people who attended, to the team of professionals who came together bringing all of their gifts and talents to bless us.. All of whom we found out while we were there, each had a vision and dream to create such an experience, and through their prayers and faith, they were all brought together to meet one another, through miraculous, divine timing…”for such a time as this.” Their dreams and prayers became a reality and incredible experience for all of us, and we were part of the “pilot program” that forever changed all of our lives. I will blend in what I know of their stories, as I take you through the week. So, as my journey begins, we left very early on Sunday and headed to the airport. My husband was taking me to one airport, as my son was heading to another airport to pick up my brother, who was coming in from California for the week to take care of my parents. On the way, my husband prayed for me, then stayed while I checked in curbside… and after a long hug, I walked away with tears streaming down my cheeks, took a big breath, and just asked the Lord to hold me tightly as we walked through this together. I got through all the security, found my gate to wait at, and then picked up some healthy choices to have a little breakfast. Olivia and Hannah always send instagram pictures of their healthy choices in airports when they travel, so instead of just grabbing comfort food and not thinking, I really looked around at two venues, and chose some good foods from each of them. That was a ‘first’ for me, and I felt really great about it. Let me stop a second and introduce Carter Hays to you. I could probably spend a few pages just writing about him, but let me take a quote from Hannah Curlee, as Carter was the trainer who took her to the finale of the Biggest Loser, where she came in second to her sister, Olivia. 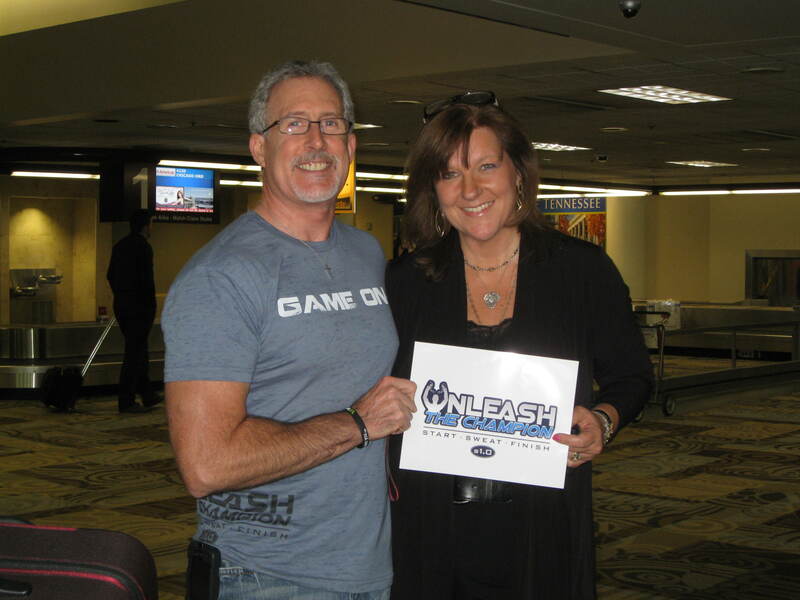 This is the man who envisioned this “Unleash the Champion” program, along with Hannah and the team God divinely placed together. Hannah writes, “…We trained so hard, Carter’s nutrition plan and training program transformed my body in a way that I thought was impossible. I began to meet people who had been touched my this ministry he calls physical fitness. It was amazing.” Carter is an amazing trainer, and physical fitness is his ministry. He gives all the glory to God, and pretty much everything he passes on so eloquently and with such passion is not only scientifically sound and true, but also Biblically based. This week that we were all about to walk through, was now his dream come true. So there I was, waiting at the gate for my plane, reading his packet, highlighting and taking loads of notes already. I was trying to focus and not let the fear of flying take hold of me. Well, here starts all of the incredible “God-incidences” of the week ahead….The packet started out talking all about hope, perseverance, confidence..then lead into a whole section on fear and courage. As I read his words, I was feeling more and more empowered, and couldn’t believe that this was the section I happened to be reading at this point in time. 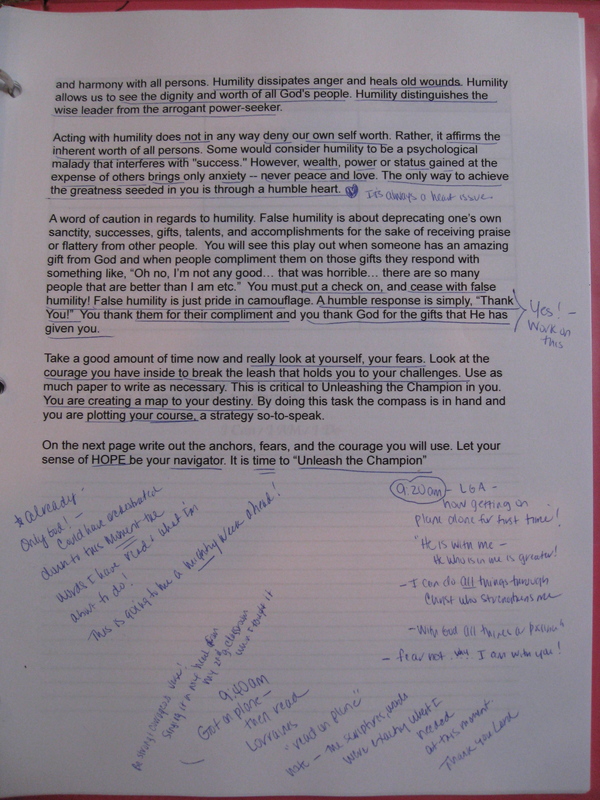 I underlined and starred and put the words, “wow” and “yes” next to so many statements…”Fear can be transformed into freedom”, “face your fear when you are experiencing great anxiety”, “you may have been anxious about many things, most of which we all realize will never happen”, “overcoming fear is the application of faith”. Courage is the opposite of fear. All of these words of wisdom were just washing over me and helping me let go of my fear and anxiety. My niece, Noelle, who is only 12, actually had to fly from California to Pennsylvania all by herself for a funeral the day before I was leaving. She called me a few times, as she was nervous, and I prayed with her and told her to picture the Lord holding her right hand, and I told her that when she got nervous, she should just squeeze His hand. I shared Isaiah 41:13 with her..“For I am the LORD, your God, who takes hold of your right hand and says to you, Do not fear; I will help you. We prayed for the Lord to put his angels around the plane and I told her that she was in the palm of his hand, not to worry. I prayed for her throughout the day while she was on the plane, and prayed that she would enjoy it, and when she called right when she landed, she actually said that it was “fun”. I kept thinking of her and how brave she was and kept saying, Lord, if Noelle can fly across the entire US, I can fly a few hours to Nashville, and I know that all of the promises I shared with her are for me also. I shut my notebook, got everything together, and my seat was called. I boarded and got buckled, and remembered that my friend, Lorraine, had come over the night before and placed 6 letters and notes in my binder for me to open each day while I was away. She wanted to come with me so badly, but she is a teacher, and there was no way that she could take off for a week so early into the school year. 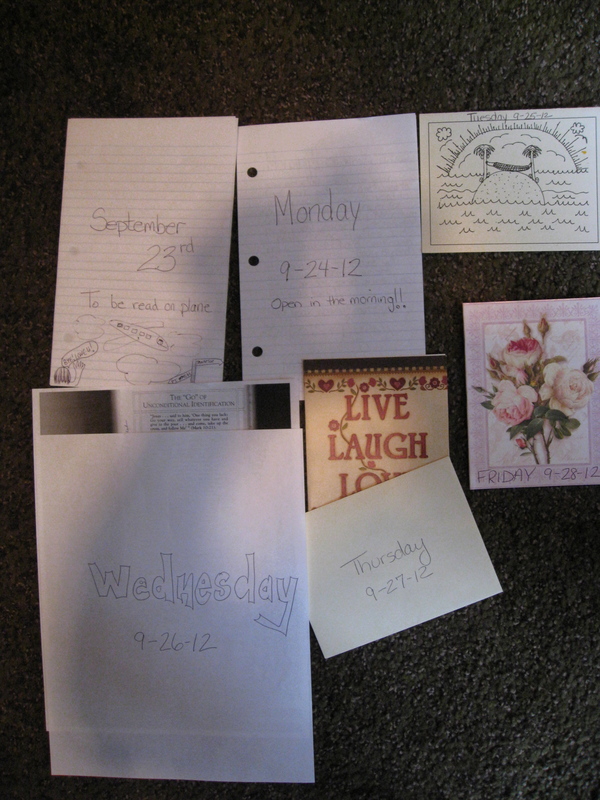 So, she promised to pray for me while I was away, and placed all of these letters and notes into my binder so that she could be with me in that special way. After getting settled in my seat, I opened the first letter. 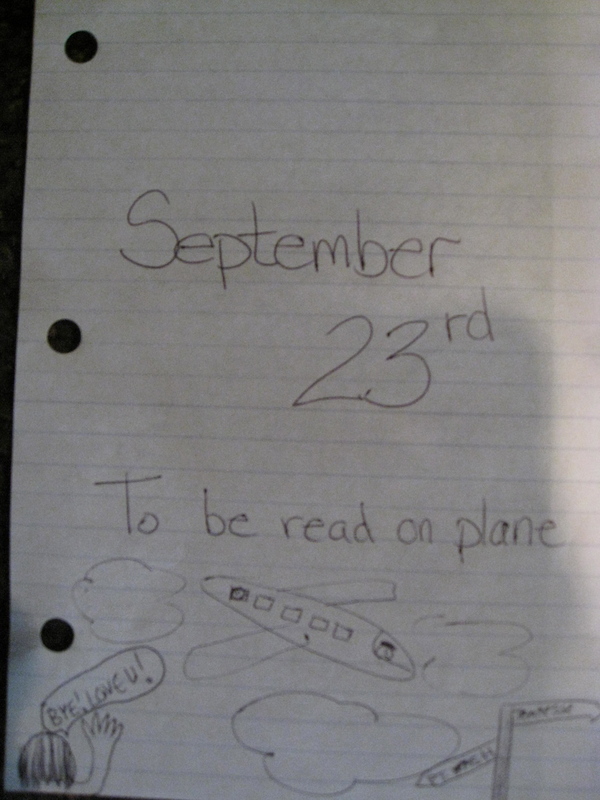 It was on notepaper, and on the cover of the first page it said, “September 23rd To be read on Plane” and had a drawing of a plane on it. “Day 1-Take off!!! Wow, you are taking off on yet another new journey…but know this…YOU ARE NOT ALONE!! -The lord Almighty is with us; the God of Jacob is our fortress. Psalm 46:7. -Be strong and courageous. Do not be afraid or terrified because of them, for the Lord your God goes with you;he will never leave your side. Deuteronomy 31:6. HE is with you my friend! I will be praying for you each and everyday. I am in AWE of your willingness, your desire, your perseverance, your bravery…and much more. Of course, there is a piece of me that is jealous and wish that I could be sitting in the window seat next to you. But since I can’t be, I commit to you to do my very best at a workout routine while you are away. I was able to start walking/jog this week 3 times so far. But I want and need more…so I commit to work out, someway, somehow everyday you are away. I will write it out or log it in too! Wow, what a gift! When I read her letter, the amazing thing was that when I taught 2nd grade years ago, Deuteronomy 31:6 was one of our class verses that we said together in a certain way together all the time, sort of a song. It came right back to me in that instant, and as the plane sped up heading down the runway, and we started to climb into the air, I held onto that verse, I closed my eyes and just kept saying it over and over again until we were level in the sky, smiling,again, at another “God-incidence”… that Lorraine would choose this verse to share with me at this particular time. She had no idea how much this would mean to me as she was preparing all of these letters, allowing the Lord to use her in such a special way, choosing a verse that was so important to me. During the flight, I finished reading Carters booklet, highlighted so much of it, then actually slept for a bit and actually didn’t think about the flight at all. When I woke up, I decided to be brave and open the window shade, I saw that we were pretty close to the land, and within seconds, the pilot then said, “10 minutes to land!” It was a quick, perfect landing, and we were at the gate very quickly. When I reached the baggage claim, my bag was one of the first ones coming out. Then, I found the baggage claim area where we were all suppose to gather to meet Carter for our ride to the ranch. Eventually, I looked over and saw some girls sitting by the baggage one area where we were told to meet. I went over to talk to them. (I didn’t realize it at this point, but one of them would be one of my room mates). Within a few minutes, we saw Carter coming towards us. 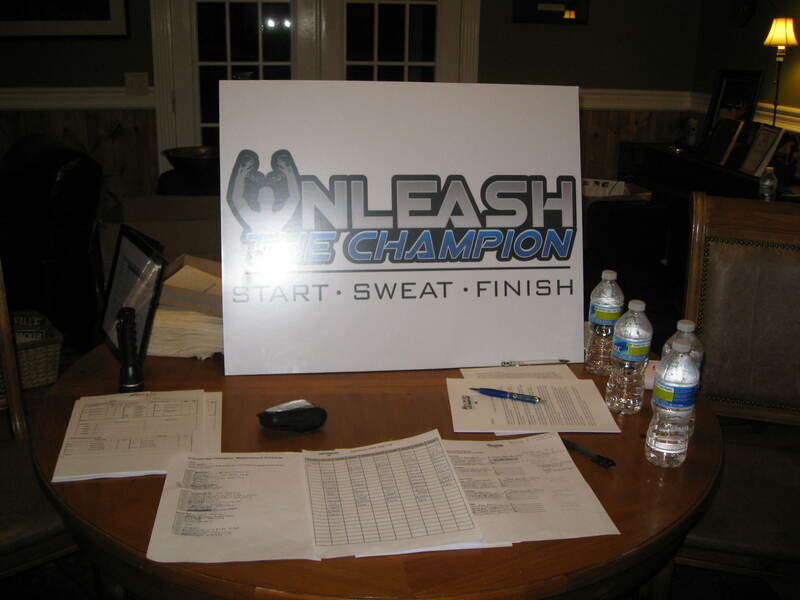 We knew it was him from far away as he is so fit, and as he got closer, he was carrying an “Unleash the Champion” sign. It was really exciting to finally meet him. When the last woman for our group arrived, we made our way to the van. I was really happy to find out that I wasn’t the only one with 2 suitcases. Pretty much every woman had 2 suitcases. As we all started to get to know each other, and compare luggage amounts, we all admitted that we had no idea what to expect, how many sets of workout clothes we would need, etc… It just goes to show, women are women…our fears, insecurities, worries seem to be the same no matter what state or country we are from. We all loaded into the van, women were from all over the US and there was a woman from Canada. She actually had to sit right in front of me, sitting on 2 cases of water, facing me, as we were one seat short. As we drove, we started talking and getting to know one another, and Carter also told us about the areas we were driving through. 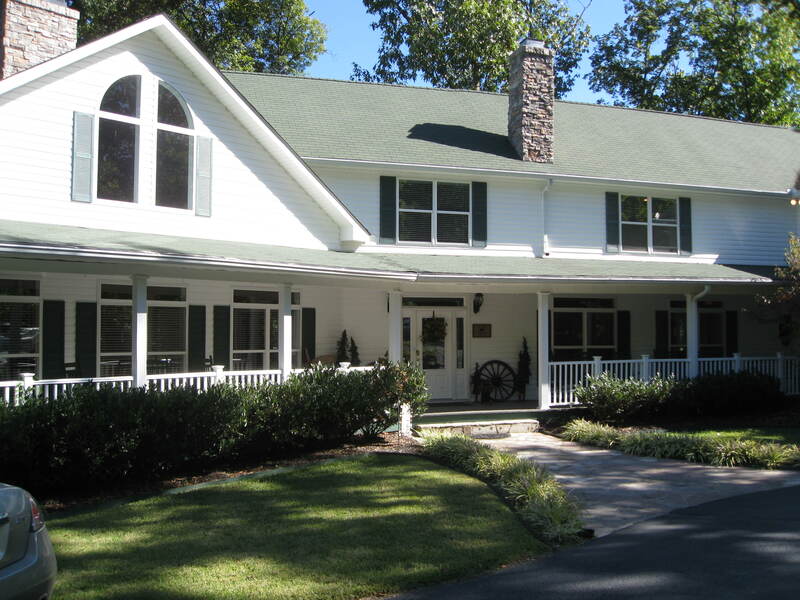 We passed gorgeous houses and ranches..neighborhoods where many famous singers lived, as Nashville is definitely a place to come and record music. Carter pointed out that they are well known for their recording studios. My son has actually gone to Nashville with his band a few times, and he has said on more than one occasion that he would love to live there. As we drove to the ranch, listening to Carter share about the area and the people, I began to understand why. 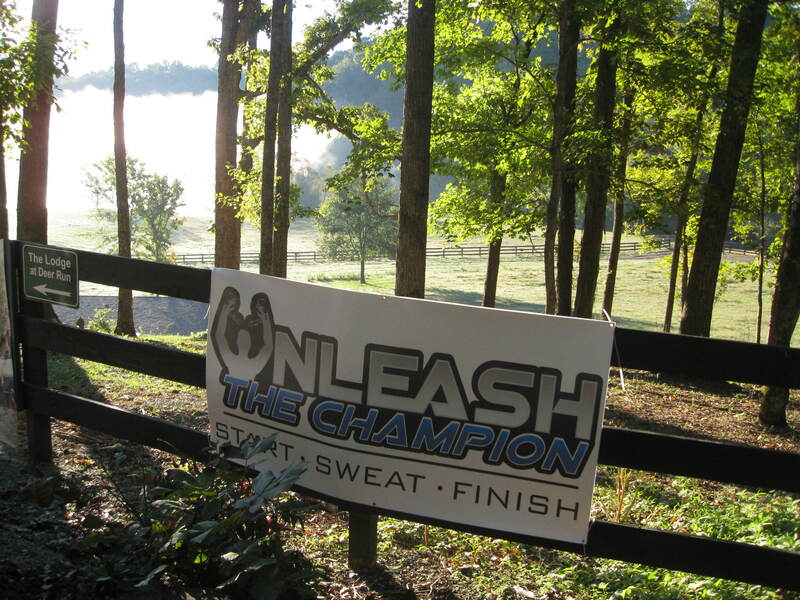 As we pulled onto ranch, there was a big “Unleash the Champion” sign. Horses were in the meadow, and it was a beautiful piece of property. We pulled up to a huge white tented area, where there were such nice people there to greet us. They had bags for each of us, with the logo of the company that Hannah works for, and each bag was filled with fun stuff for us…”Unleash the Champion” shirts, bracelets, water bottles, bars, magazines, etc. We all hung out there for a while sharing stories and getting to know one another as each group arrived. 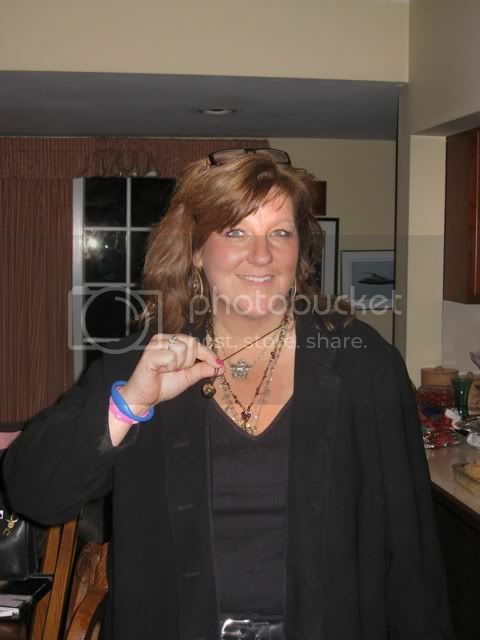 I got to share some of my Dr. Oz story with a few women. We continued to mingle while waiting for our rooms to be ready. I was just so totally blessed in that moment. Candice, Carter’s wife, had been praying for all of us by name since we signed up…what an incredible gift. Especially since I know even just for my circumstance, that only by the grace of God and with much prayer, was I able to take a week off from all of my responsibilities at home, especially with my ailing parents, and be at this retreat. I know that only through prayer and God’s grace and timing.. was I on this ranch, along with each and every other person there…”for such a time as this”. A little while later, we were driven up to the lodge, and on the way, we were told that our room assignments were written on the back of our name tags. 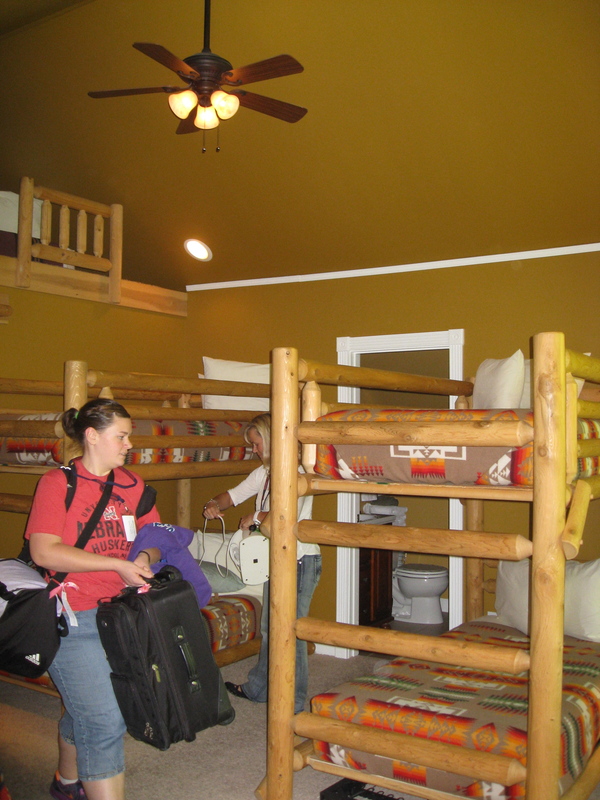 We found our luggage on the porch and then entered the beautiful lodge and were directed to our rooms. Ours was up the stairs, off the main living room, in a section by itself. We had a bathroom in the room and another small one in the hallway….so great! 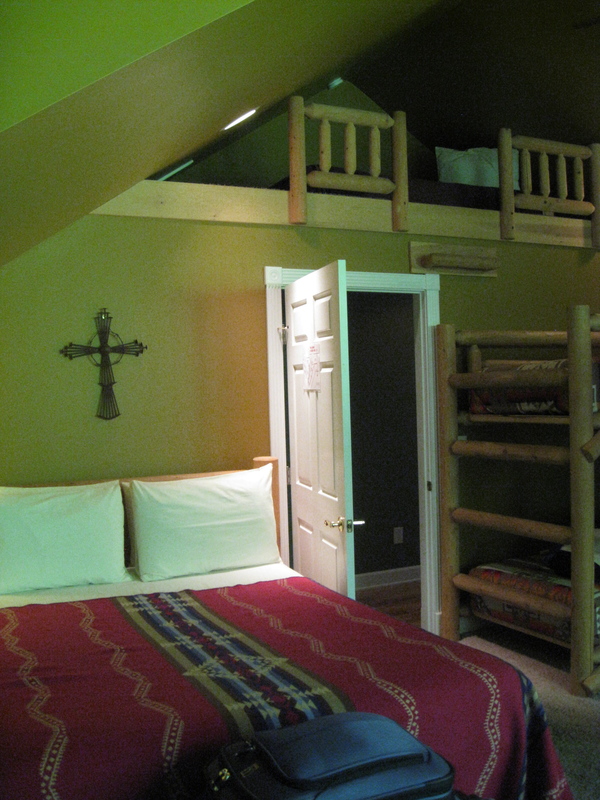 Then when we entered the room, there were 2 sets of bunk beds, a bed up in a high loft and a queen bed on the other side of the room. Mine was the queen bed!!! Wow!…God knew ahead of time that I was going to be up very late every night writing about each day, and there was a lamp next to it that I could leave on while writing, so that I wouldn’t disturb my room mates too much having to keep the light on while writing…. Only God! As we unpacked and visited and met our room mates, it was already becoming evident that the Lord literally hand picked each one of us to be in that particular room. After we organized all our stuff throughout the room, We were all sitting on our beds, and Darcy asked, “OK, so why are each of you here?” It was a brilliant question that not only broke the ice, but lead our room into the greatest time of sharing some of our stories. It’s both amazing and beautiful how Christian women can go straight to the “heart to heart” talks. That time of sharing was really special, and we began to build strong friendships from that very first day, those very first hours of meeting one another. After our great visit in our room, we all went downstairs to dinner. For this first night only, it was in the kitchen/dining area of our lodge. It was set up sooo beautifully. It felt like a beautiful fall dinner in a log cabin. The tables were set with candles and pine cones and wooden trays. We met our cook/chef, Chris, and his assistants. He explained all of the healthy foods we were about to eat, how they were prepared, the approximate calories, and he showed us what a healthy portion was. Everything was so delicious, and as moms/busy women, it was such a gift to have someone cook such incredible, healthy meals for us. 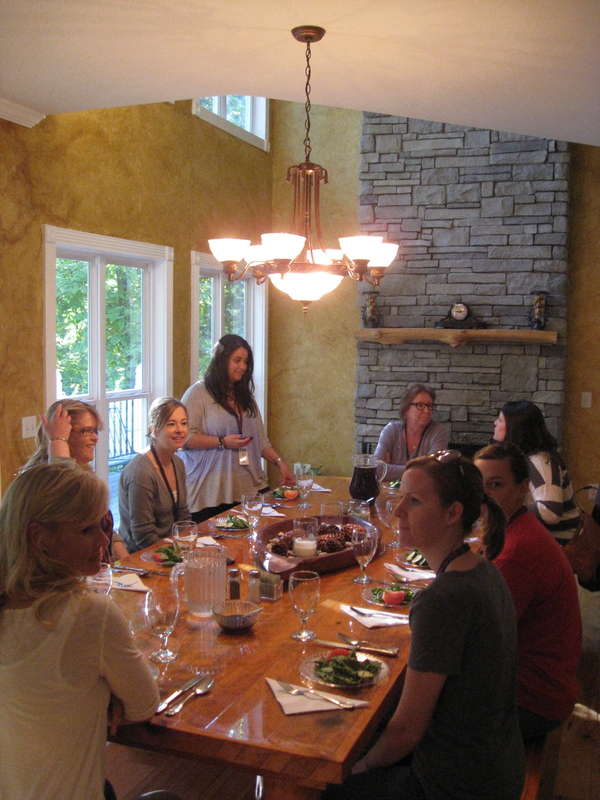 As we sat at our tables, we started to meet more of the women, shared more of our stories. I heard a beautiful accent coming from the table next to us, and found out it was a woman who flew all the way in from England. 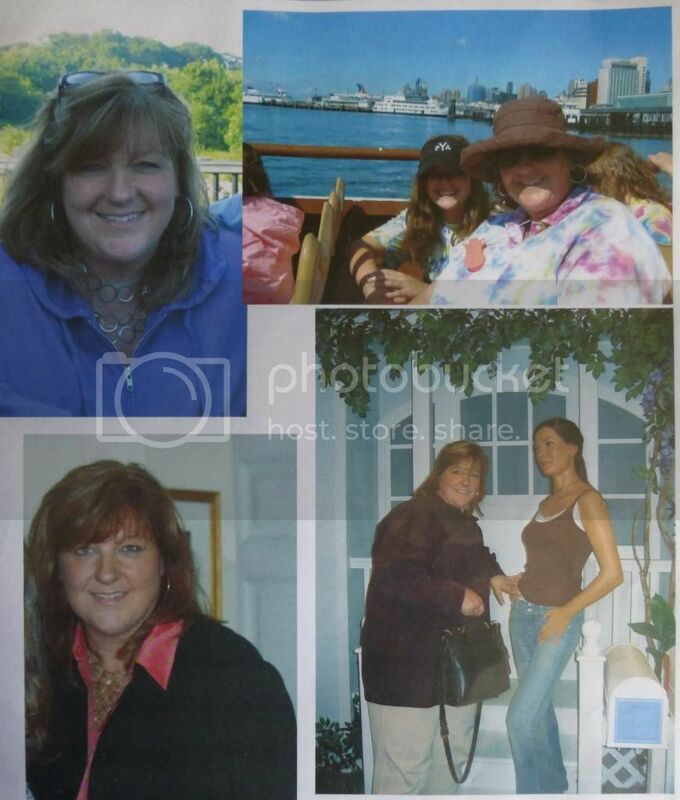 She was inspired through the internet watching Hannah and Olivia on the BL, and she had lost 100 pounds! Her name was Mary ( in my head I referred to her as Queen Mary from England, so that I wouldn’t forget her name-later). When I had the time in the coming days to hear how she lost 100 pounds, I found out the she just walked and cut back on food portions…wow! What an inspiration! During our dinner, Keith Curlee (Hannah and Olivia’s dad) stopped at our table for a visit. He is absolutely one of the most precious men I have ever met. He had driven another van of girls from the airport. He was so excited to share with us, that since the show, his family has all gotten on board, and together they have lost over 700 pounds! He was almost 100 pounds down. He was just so proud. He said to us, “I use to eat my daily bread, and everyone else’s daily bread! Now I have learned just to eat my own, and not too much of it.” I told him that one of my favorite episodes on The Biggest Loser, was watching him play volleyball with Hannah. He got choked up a bit, and said that it still makes him cry just thinking about it. What a special man. It was really great to meet him in person. I have read many of his wise words, and would love to hear him preach or speak one day. I think he will be one of UTC’s speakers on a retreat one day, he has a lot of great wisdom to share, and I would love to hear him speak. As we continued visiting at the table, another women heard my name and said,“Oh, you’re Wendyweighsin!, I read your entire blog on vacation. I stayed by the lake and didn’t get up until I read the entire thing!” I was stunned, excited, had goose bumps on my arms,… literally trying to take in the fact that, again, someone far away, who didn’t know me, was reading my blog and was inspired. 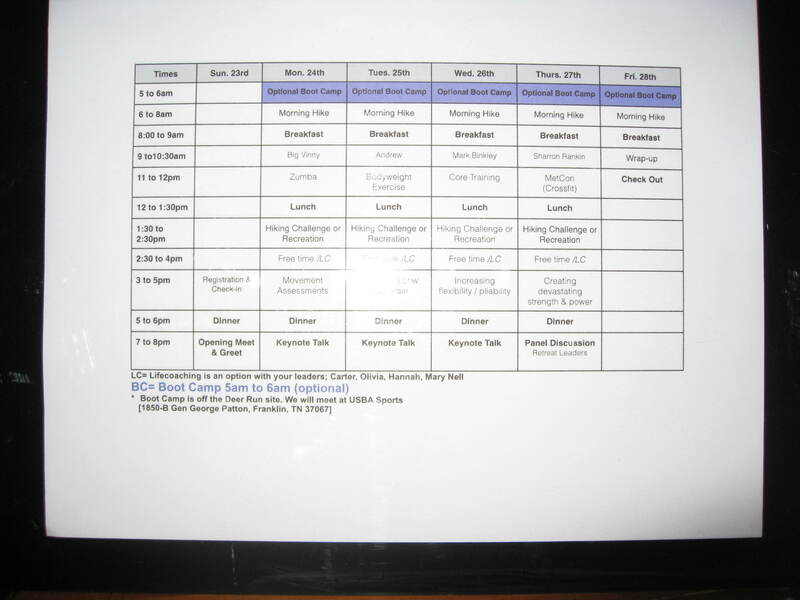 Wow….again, think about all that is happening so far… can you believe this is just day1?! After dinner, Carter gave some instructions about signing up, as everything was optional. 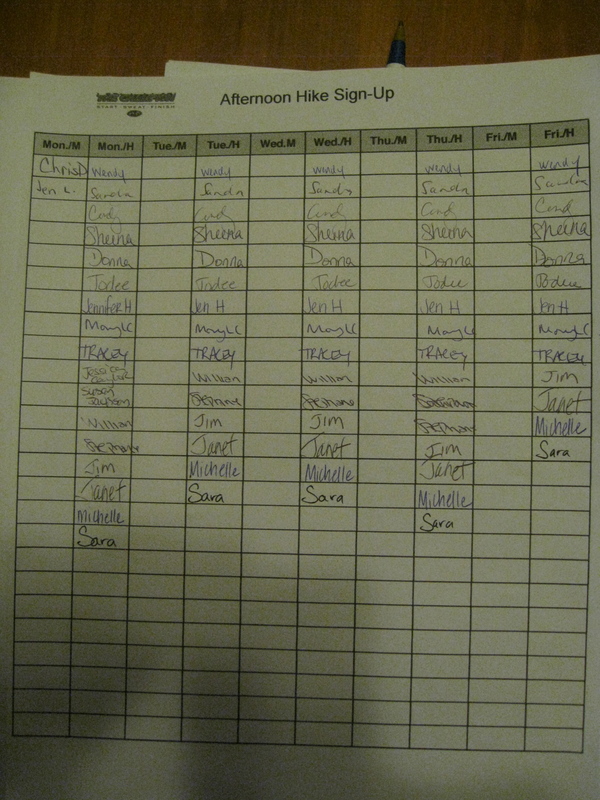 There were sign-ups for boot camp, hikes-moderate and hard, etc. We decided right from the start, as room mates, that we weren’t going to miss one thing. No matter how hard something was, we would all try it together. So we went right over and signed up for everything. At one point, we were all told that there were only so many spots in the van for boot camp each morning, but one of our room mates, Beth, had her car, so we could all drive together, to and from the gym (which was 45 min. away), and this way we would get to go every day. Although it seems like 45 minutes was a long way to go for boot camp every morning, this actually became a great time for all of us to visit and get to know one another even better….ONLY GOD! 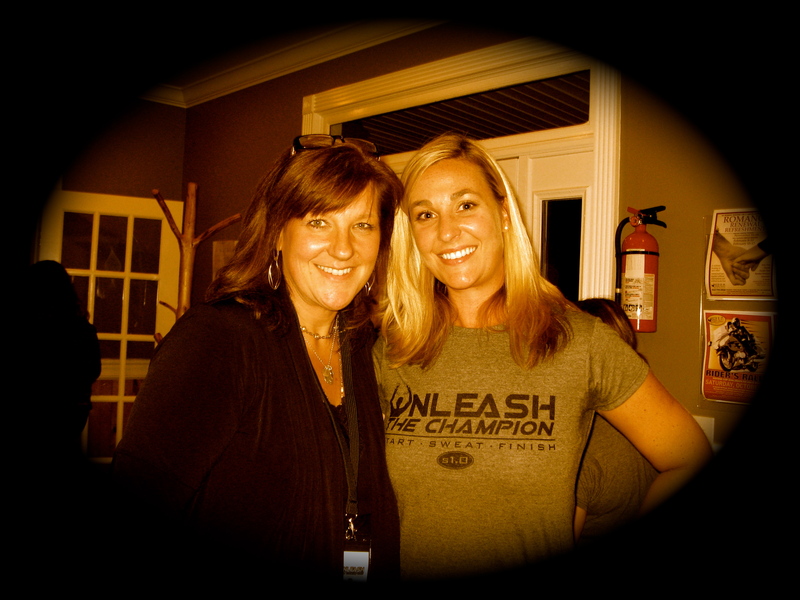 So after having dinner and completing all of the sign ups, we were all standing around visiting in the lodge, everyone was getting to know each other, and shared about how excited they were to meet our “inspirations from The Biggest Loser”. I was standing near the front door, in the main foyer, talking with Carter and his wife, Candice. I was sharing about how I knew Olivia, how she was a big part of my story and journey so far, and also shared a bit about my Dr. Oz story. 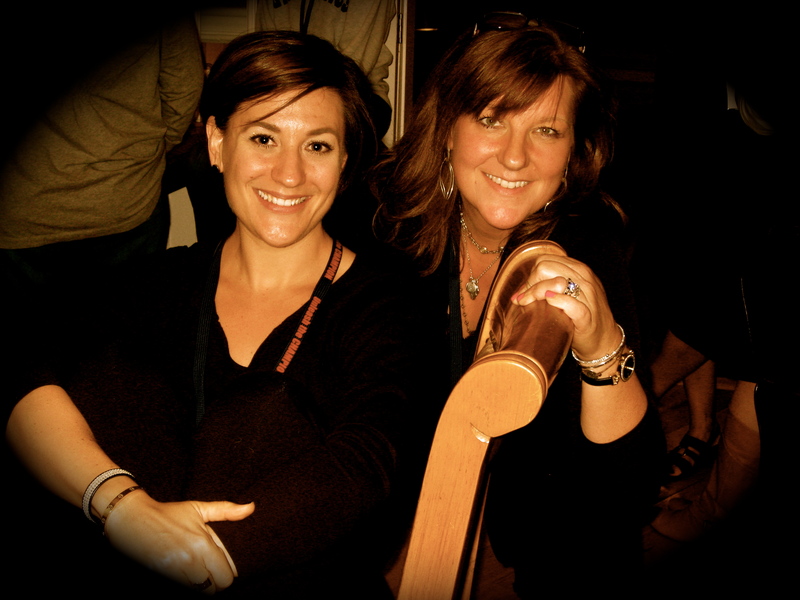 As we were sharing stories, the front door opened….and in walked Hannah, Olivia, Courtney and Marci, and another amazing woman, Mary-Nell, also known as Murn, who you will learn about as our story unfolds during the week….well, Oh-My-Goodness! !… we were all completely star struck! They walked in, slowly conversations halted, and everyone looked over toward the front door, and we were all just in awe! They all walked in, spread out, and just started hugging each of us… saying hi, thanking US for coming!…they were all so genuinely happy to meet all of us. First I hugged Hannah as she came in, introduced myself, and she was so excited to meet me, and knew who I was already because of Olivia. Then, it was so exciting for me to see Olivia and just hug her.. she is just extraordinary, and really continues to inspire me every time I see her. Then I hugged Marci and Courtney, and they already knew who I was from Olivia. I was astounded! I had just dreamed of somehow getting to know all of them during the week ahead, and they already knew who I was. Really??!!!! After they greeted and hugged everyone, they sort of ended up spreading out in the rooms… and I’m telling you, within moments, each of them, individually on their own, just began to visit and share from their hearts with the women around them in such a beautiful, honest and precious way. They shared right from their hearts, answered every question we had, and listened to some of our own personal stories. I spent the first part of the night talking to Courtney. She is absolutely so beautiful in person. She just glows and shines as she speaks, with a joy and passion and love that goes beyond words. Her mom, Marci, was only a few steps away with some women around her. She also exudes such joy and love and confidence and passion… and it was really beautiful to see how close they are, even keeping an eye on each other.. And even from afar, sharing some stories together as we all listened. What an incredible mother/daughter relationship. You could see it on the show, but to stand there and just see in their eyes…and personally feel their love, respect, admiration for one another, and the way their stories and lives are so intertwined, was such a gift that night. I asked Courtney all about her surgeries, and she was so honest about everything she has been through. Anything I asked, she just shared from her heart. It was just incredible. Just as in our room with my room mates, we all , as women, shared heart to heart that evening. I got to visit with all of them. First Courtney and Marci, then Hannah and Mary Nell for a while, and towards the end of the night, when things were winding down, I was in a circle of women listening to Olivia. At one point, while she was talking, Olivia mentioned a little bit of my story, and with that, another woman said, “oh YOUR Wendyweighsin?”…I continue to be absolutely blown away at the thought of these women reading my story from all areas of the US, and even Canada! And, again, it was quite a surreal moment to be in a group of women, all there to meet and hear from Olivia, and have her share a bit of my story with them. CRAZY! I keep wanting someone to pinch me at times…. ONLY GOD! they went from walking in as “super stars”, to leaving us that night, already as girl friends. It was absolutely surreal, like walking through a dream…. the whole evening.. the whole day!…and to think all this unfolded and was orchestrated in such a mighty way…..and it is only the end of day 1! I laid everything out, packed my bag, filled my water bottle, then, although it was so late, I stayed up for a while to write down as much as I could remember about the entire day, so that I wouldn’t forget a thing. I was absolutely exhausted, but knew I had to get it all written down. I realized at this point, also, why the Lord blessed me with the queen bed with the lamp on the other side of the room…it was so I wouldn’t disturb all of my room mates who wanted to get to sleep as soon as possible. I continue to be absolutely amazed at how he cares about every detail of our lives. So, already, I head to bed, at the end of day 1…saying my prayers, praising Him for all that He as already done, as well as what He is going to do in this week ahead..placing my head on the pillow, exhausted and in awe….knowing for sure….ONLY GOD! This entry was tagged 3C wellness, Biggest loser, boot camp, carter hays, exercize, first experience, hannah curlee, healthy-living, Olivia Ward, Weight Loss. Amazing!!! Your writing brings us all right there filled with your joy and excitement. Thanks for the post; looking forward to Day Two!